Waxpaper cartons – (milk cartons, juice boxes, etc.). Before placing bottles, cans and jars inside the containers, bins or the blue recycling bags, residents should rinse the materials. All paper materials should be placed in a "grocery-style" plastic bag prior to placement in containers or bins. This will protect the materials from moisture and keep them from blowing into the alleys. Cardboard boxes can be flattened and placed in containers or under bins to maximize space. To assure pick-up, place all recyclables next to your trash cans by 7 a.m. on their scheduled collection day. City sanitation personnel have confidence that the material in the blue recycling bags is intended for recycling. The City-marked containers and bins provide crews with that same level of confidence. Residents are urged not to place recycling material in any thing other than the City-marked containers, bins or blue recycling bags. Blue recycling bags can be purchased at any local grocery or drugstore. For $10 residents can now exchange their existing 18-gallon recycling bin for a 32-gallon recycling container with a tight-fitting lid. The lid keeps contents dry and prevents materials like newspapers from blowing away. Those who don't want to exchange their 18-gallon recycling bin can purchase a 32-gallon bin for $20. Residents should note that the new containers must comply with the same City Code provisions that apply to trash containers. Specifically, the 32-gallon containers cannot be placed in the alley right-of-way and their lids must be attached to a fence or other permanent object. Residents can request one of the new recycling containers by calling 3-1-1 or by submitting an online request, click here. Once a request has been made, the new container will be delivered to the alley or regular trash collection location for that particular address. The trade-in bin should be left for a sanitation crew member to collect at that same location. The $10 charge for the new container will be added to the resident’s next utility bill. While residents are still allowed to deposit recycling material in the more familiar blue bags and bins, residents should fill their containers or bins first and then use the blue bags. 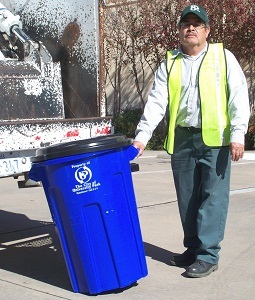 Residents may request additional information regarding recycling operations by calling 214-987-5451. Phone calls will be answered between 8 a.m. and 5 p.m. on weekdays. The City of University Park and the Town of Highland Park host two community recycling events a year. The spring event is held in April, the fall event is held in late September or early October. Paper products, e-waste and clothing/household items are accepted. Paper products and documents that can be disposed of include: Tax records, medical records, legal files, financial records, invoices, canceled checks, blueprints, contracts, payroll records, company letterhead, junk mail containing personal information, and any information that contains credit card, social security, driver license and account numbers. Accepted E-waste items include: computers, computer monitors, computer accessories, TV’s, printers, DVD/CD players, copiers, fax machines, scanners, cell phones and chargers, external hard drives, video and camera equipment, video game systems, microwaves, cables, power cords, powers strips and more. Shred-it collects and shreds all documents on-site. Global Asset collects and disposes all e-waste items. In addition to working with the City and other municipalities, the company currently supports over 150 clients in the public sector. Global Asset removes data on all collected storage devices using Department of Defense security standards. The Salvation Army or Goodwill also participates in these events. Specific dates are advertised on the City website, in the local media and on social media.